Today’s guest blogger is Diona from All Day Everyday Mom. Diona’s motto is, “A family that plays together stays together!” She and her husband live in Denver, Colorado, where they enjoy being outdoors, the incredible scenery and just hanging out at home watching movies. As a homeschool mom, I’m always looking for resources that make learning fun. I want products that will make my life easier. 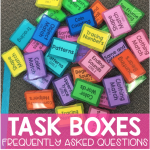 Recently, I found Michaela from Especially Education on Instagram and immediately fell in love with the concept of task boxes. At first I thought, “These are so great! 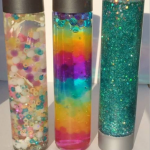 I should make some for my kids.” Then I realized how much work went into one of Michaela’s activities and decided to just purchase one month instead and be done with it. It only took an hour of printing, laminating, and cutting to realize I needed to purchase more task boxes! I made about five different trips to Joann Fabrics for Velcro dots and drove 30 minutes to a Michaels store to find the colorful photo boxes to store each task. I could not wait to share them with other moms in my homeschool community! I love that the task boxes are easy to assemble, store, and take along with us. Currently, I’m separating the different tasks by subjects and storing them in bins I found at Walmart. Separating them by subject makes it easier to plan each week. I can simply pull out my lesson planner, see what concepts we will be learning, and then grab the activities that correspond with each lesson. This way it’s easy to reinforce concepts that we learn each week. At the end of our school day, I take a few minutes to set out our task boxes for the next day. I coordinate the task box activities with what we are currently doing in their online curriculum, Reading Eggs. This way as soon as the boys finish their computer work I can pull out the trays, and they’re ready to go. 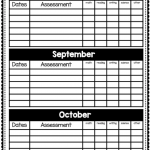 The trays have the tasks charts in the order I want the activities to be completed, along with each box of activities. We know exactly what needs to be done, and they know what order to complete each box. I don’t want to waste time trying to find each activity every day. The boys like to choose their incentive first thing in the morning. I really feel like this motivates them to get their work completed and with a good attitude. After they complete a task I like them to leave it out until I can check their work. When I’ve completed checking then they can put everything away in the box and back on the tray. Easy clean up! I love that we can take the boxes to different rooms in the house, outside in the backyard, and even on our weekly library trips. My boys aren’t big fans of workbooks and sit-down work, so these task boxes allow them to spread out on the floor, cuddle with me on the couch, or take them on the go. They also don’t mind if I pull them out on the weekends. My hubby likes to grab a few boxes and work with the boys on Saturday morning before they begin playing video games together. It’s kinda like their thing, and I love it! Being a one-income family, I chose not to spend a ton of money on curriculum sets. Instead, I like to find more affordable and creative learning resources. I instantly fell in love with the fun, bright-colored activities included in each monthly set of task boxes. I couldn’t believe how many activities were included and at such a small price! With two different levels included in each month, I can use them for both my kindergartner and first grader. It’s perfect for families with multiple age students. I can’t tell you enough about how these task boxes from Michaela’s Especially Education have changed the way we do school in our family. My boys actually look forward to opening their boxes and seeing what fun activity awaits them everyday. When we have rough days and the kids are grumpy, hyper, or unfocused, I know we can just stop and regroup by turning on an audiobook and laying out a few task boxes and all is good again. They have become my little secret weapons! Be sure to follow Diona on Instagram at @alldayeverydaymom.